Cities, public organizations, and industries around the world are joining the Smart City Initiative. One of the important components of Smart City is “SMART STREET LIGHTING”. Cities, municipal corporations around the world are adopting the Smart Street lighting solution by replacing their old street light infrastructure which includes CFL with the LED lights connected to the Internet of Things. MosChip’s Smart Street Lighting solution gives the cities and municipalities the capability to remotely monitor & control the street lights in a much efficient way. 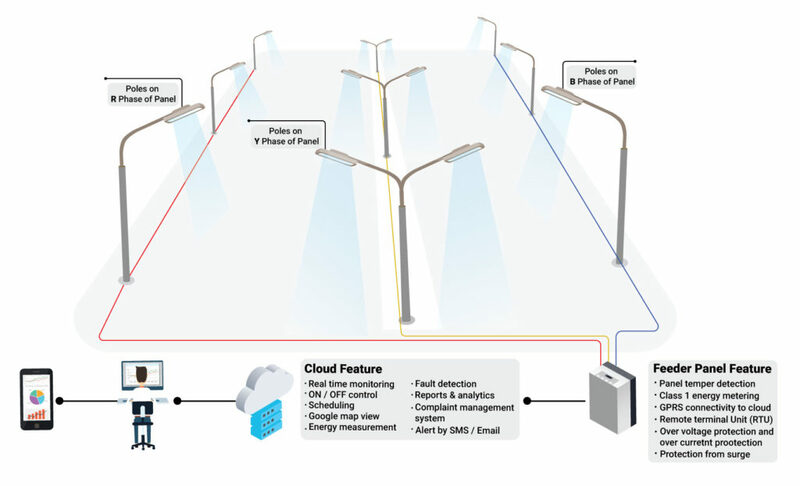 Our Smart Street Lighting Solution has internet connectivity to upload the data collected from various poles/areas on to a cloud application, to enable remote monitoring. The operators can access the data from a single dashboard using a smartphone or a desktop. With our solution, the street lights can be scheduled according to the time of the day or as per the operations. MosChip’s Smart Street Lighting Solution allows the user to monitor the street lights & control light output from anywhere. The user can remotely switch ON/OFF the lights, schedule the lights and detect faults via an intuitive dashboard from anywhere. Our Smart Lighting Solution helps the cities, reduce the maintenance cost and promotes accurate maintenance. In case of any faults/failures the technician/operator will get an alert via SMS/Email. 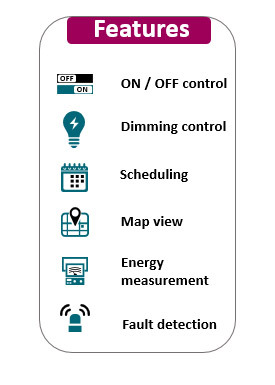 Our Smart Lighting Solution provides real time update of the lighting network status and faults on the operator screens. Get real time asset location with our digital maps integration. Our Smart Lighting Solution helps reduce CO2 emissions that is generated by the traditional street lights. The existing CFL are replaced by LED in MosChip’s Smart Lighting Solution. Our intuitive dashboard provides data on electrical parameters like KWH, KVA, KVAR, PF, V, I phase wise helping cities make better & informed decisions. Our Smart Lighting Solution helps cities save up to 35% of the energy cost with automated dimming, scheduling, ON/OFF and real time reports. 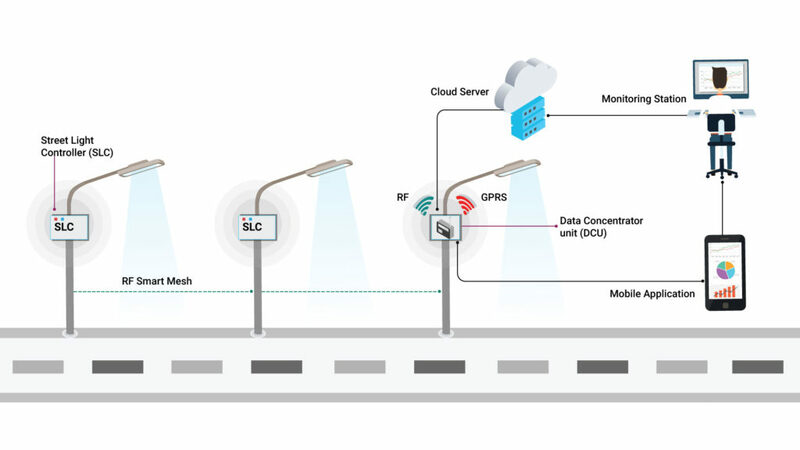 MosChip’s Smart Street Lighting Solution uses a CCMS (Centralized Control and Monitoring System) is a GSM/GPRS/RF-based product, designed specifically for Street Lighting Projects to ensure optimal on-field product performance including remote and automated control capabilities. This product is a must-have tool for Smart Cities. The use of CCMS is intended to control and monitor various performance parameters of led street lights. Our feeder level automation solution for Smart Street Lighting is recommended for the area where the lighting load is separated. 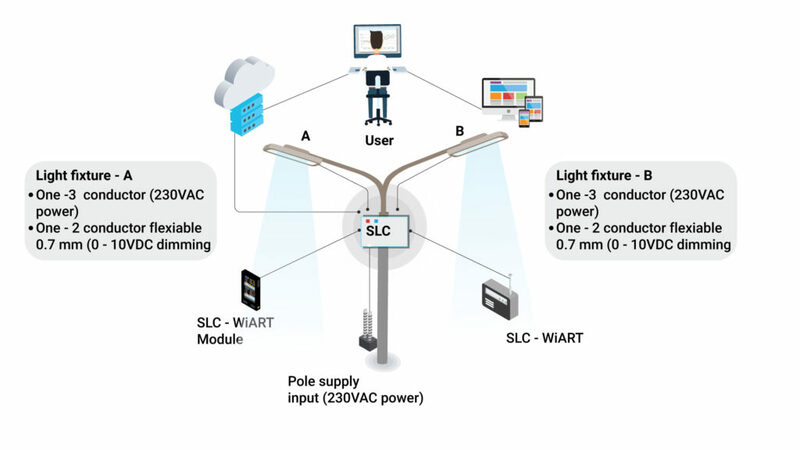 It enables automatic group-based monitoring and control of the lighting load in an area. Retrofit solution, no separate wiring required, can be installed in the existing electrical system. Saves wiring cost – feeder and overhead cabling cost. Two-way control of every individual light – On / OFF / DIM / faulty light detection. Metering of every individual streetlight based on usage. One DCU can support 200 streetlights – lower recurring cost of GPRS. Mesh network enables coverage in kilometers. Secured communication – 128-bit AES encryption. Over the air configuration and firmware upgrade. Modular, scalable lighting management platform.